The young TFC Academy graduate burst onto the scene back in 2010 and immediately made a name for himself. His powerful and confident runs on the wing and his fearless approach to playing against MLS veterans was a breath of fresh air for a team known for its cautious approach in the attack. RedNation Online caught up with Lindsay, who updated us on what he’s been up to, his new team, recovering from a season-ending injury and finding happiness with life after Toronto FC. Burlington is a new franchise in the Canadian Soccer League, and one that Lindsay helped kick off. He scored the first goal in the club’s history, but also coaches the U10, U12 and U14 kids’ teams. Come January, Lindsay will also help with coaching with the Burlington SC Academy. 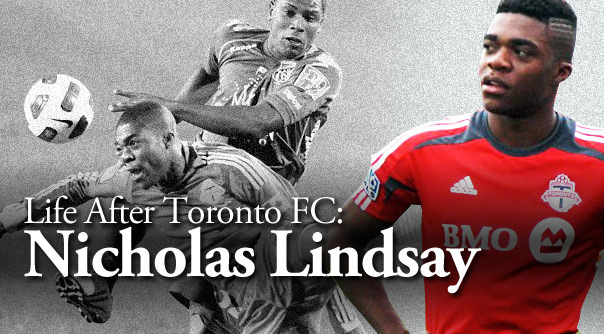 When Lindsay played with Toronto FC, he was one of the first TFC Academy players to make his way to the senior roster. He handled that transition with his trademark positivity. But a bright start soon turned into a dark reality. Lindsay was injured in a snowmobiling accident, ruling him out of the 2011 season. One year later, he returned to full fitness, but he found it difficult to find a chance under new management. Lindsay lamented on the lack of a chance, repeating several times that he was 100 per cent fit and ready to play. Those words fell on deaf ears. “I was hungry. I was ready. I saw how bad the club was doing and knew that stepping in I could make something happen. Not being able to get that shot was disappointing,” he continued. It’s not the only thing about the team that disappointed him, though. In Burlington SC, Lindsay has found that chance to shine once more. A blessing, one that Lindsay has never taken for granted. His faith is a major part of his character and a driving force in his professional and personal life. “Soccer, family, everything in life, God comes first,” said Lindsay. “That’s one thing I’ve been taught growing up and that’s one thing that has really helped me throughout my career and in my life in general. I’ve been dependant on God and Jesus Christ is my Lord and saviour, he’s the King of kings and Lord of lords. I love having him in my life and sharing the Gospel. “Playing with TFC, playing with Burlington, it really, truly is a blessing, and without God none of it would have happened,” said Lindsay. He recalls his days at Toronto FC with fondness. For Lindsay, more than most, playing for Toronto FC was indeed a dream come true. His favourite memory of Toronto FC was his first game with the club. He also recalls a particularly impressive bit of production during his playing time. So, has Lindsay found happiness with life after Toronto FC? Lindsay has found new callings, too, whether it be feeding the homeless on Mondays with his friends or working in barbershops.